This has slightly truncated my ability to head for the hills at the drop of a hat, but I have learnt that becoming a parent doesn’t have to mean the end of car-free adventures – it just means the adventures start a little nearer to home. With a little extra expenditure and planning, children can easily become car-free walkers – much as they were for the millions of years before the age of the automobile. Here are our five top tips for happy car-free walking for kids (and parents). Whether it is your choice of destination, route or distance, you won’t be able to go as far, fast or high as you used to. How far you can travel will depend on whether you are carrying the children or if they are already walking by themselves; if the latter, then consider the nature of the terrain (hills are even more of a challenge for smaller legs), how much walking they have done, and levels of motivation on the day. It’s also worth reviewing what you consider to be an ‘adventure’: there is fun to be found in many places. Changing your horizons could well open your eyes to what lies just beyond your doorstep. There are lots of excellent children’s carriers available for walkers. We looked for one with a well-padded waist belt and shoulder straps, some decent adjustment points (my wife and I are keen to share the load, but there is quite a difference in our height) and extra pockets for spare clothing and snacks. There is also a healthy market in second-hand carriers, as most of them will outlast the years that a child needs to be in one, so keep an eye out on popular auction sites, or ask your friends if they have one you can borrow or buy. Most people will agree that children cost you money – quite a bit of it – but they can also save you money when travelling by train. Having a Family and Friends Railcard will give you a 33% off rail fares for up to four adults, and 60% off for up to four kids aged between 5 and 15. You can also name two adults on one card, so when one cardholder isn’t using it, the other can. We use our railcard when travelling with our 4-year-old, even though she doesn’t actually need a ticket: buying one means we get the discount on the adult tickets, saving money overall. Individual rail and bus operators offer other discounts, so do some research beforehand and double check with the ticket office before you buy anything at full price. 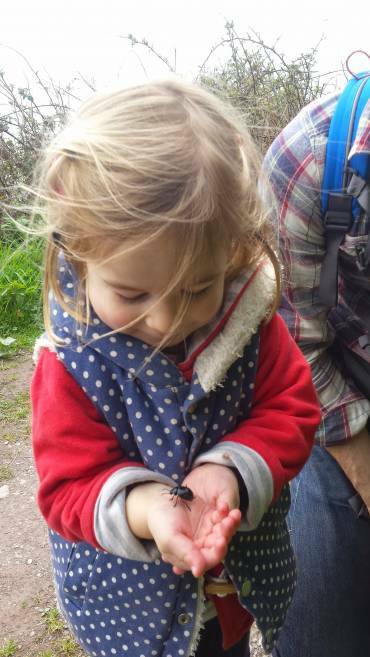 One of the joys of walking with my children is how they spot and take interest in the smallest things. It isn’t the wide vistas that catch their eye, more the fairy holes in the trees, the funky mushrooms, the magic sticks and the secret writing on the leaves. Avoid judging your walk by the number of miles ticked off; instead, take the time to explore their mini-world instead. For this reason, it’s often wise to plan a simple ‘there and back’ route, which will help you to judge the time you have available before your train or bus home – and factor in that it can take two or three times as long to complete those miles as you would need on your own. If walking a circular or linear route, make sure you have a Plan B and C in place for getting home, should the walking take even longer than expected. Never aim to catch the last bus of the day home! If you’re carrying your child on your back and it’s cold, remember that they won’t be getting warm from their own movement like you are, so ensure they are dressed accordingly. In hot weather, a sunshade will help prevent heat stroke type problems (many carriers have these). Generally, we tend not to lavish huge amounts on children’s clothing that will only last them a few months, but it’s worth considering that the sort of kit that keeps you comfortable in the outdoors will do the same for your children. So layer them up, splash out on decent kit if you can (as you would for yourself!) and take a few spares, just in case. Also, both of our little ones dislike strong winds, like most young kids: so when the millibars are closely packed, we stay low to keep out of the worst. You can search for family-friendly walks on Car Free Walks, including those which are accessible with prams. We’d love to have more of these walks to share – click here to add a walk of your own.